How 7 Inch Circle Magnets Aids to Enrich User Experiences? Enriching user experiences is not easy, if you do not get closer to them and start interacting with them. Many digital marketers are known to use several interactive online forms and blogs to gauge user responses and improving their experience. You can use 7-inch circle magnets to enrich user experiences. You may think that gauging user experiences with a passive advertising medium is difficult, but it is not difficult always, if you take care of certain things. What are they? Stay tuned to this blog to know more. Just remember the last time you received a great gift. When you think of the gift, million expressions may cross your mind. You may think about the person who gifted it to you. Or you may think about the emotions that you were experiencing at that time or something else. You can exactly make feel special by printing over outdoor 7 inch circle magnets or 7 inch indoor circle magnets. For example – Many marketers may be reluctant to invest in 7 inch circle magnets (20 MIL or 25 MIL) because they know that they are bit expensive, however they can try out outdoor magnets. These customized outdoor magnets not only offer them great visibility, but also the ability to connect with customers. Use customized circle magnets to announce some loyalty program, free community services, or programs. People would definitely think highly of a marketer who made them feel special in a typical way. If you aren’t sure, which kind of content may work for your customers, perhaps you should start thinking from the point of view of a customer. You can ask your employees to pitch in with their suggestions or you can look around and check what other competitors are doing. This kind of analyzing helps to zero on the right kind of advertisements, which interests people and enriches their user experiences. Would you like to buy from a marketer who sounds bossy. Nah right?! Read the following sentences and decide which will go with you. Avail 60% discount on platinum wedding bands. Surprise your loved one on next wedding anniversary by paying 40% of total pricing. Avoid beating around the bush because no one is interested to listen to your bragging about how you have become so and so. Talk straight to the point and tell people what you have to offer them. You can offer them the benefits of a product or benefits of getting associated with you, etc. 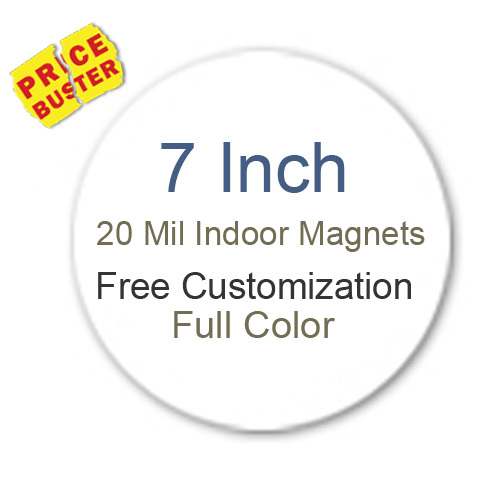 You can avail discounts by ordering these large sized 7-inch circle magnets from any reputed online e-commerce store selling advertising magnets. Save on online design proof, art setup, shipping, and full color printing because their prices are usually included within the product pricing.